Born October 17, 1940 and raised in the Brandywine Valley of Southeastern Pennsylvania, Charles Raskob Robinson was exposed at an early age to the art and influence of Howard Pyle, the Weyths and others of the Brandywine School. His bent for marine subjects can be traced to the summers he spent on the Eastern Shore of Maryland and in the waters of the Maine Coast. In high school he saw his share of river life, rowing 2,000 miles down the Ohio and Mississippi Rivers to the Gulf of Mexico and venturing alone 4,500 miles up the Amazon and its tributaries. While attending Haverford, a Quaker college, he learned metal working skills that led to the founding of Colonial Arms Foundry a company that manufactured model operational reproductions of U.S.Naval cannon of the 1812 vintage. Sold across the country through Niemann Marcus, Abercrombie & Fitch and other fine stores, these cannon appear in the permanent collections of the Independence Seaport Museum in Philadelphia, PA and the Chesapeake Bay Maritime Museum in St. Michaels, MD. His studies at Haverford College did not include any art but focused on political science and economics. After graduation in 1962, he pursued these subjects on the international front at the Johns Hopkins School of Advanced International Studies in Washington, D.C. where he earned a MA degree. Unrelated to these studies but rather summer work in a silver mine in northern Canada, he wrote a book, A Nation without Coins, which foretold of the need to replace the nation’s silver coinage. The right place at the right time, this book received front page and editorial coverage nationally, led to his testifying before Congress and eventually involved him in the drafting of legislation that basically changed American coinage for the first time since Alexander Hamilton. During his early years as a banker with Bankers Trust Company in New York City working in the international mergers and acquisitions arena, he signed up for a course meant for secretaries at the bank: “Learn to Paint” – a weekly course taught at night in the bank’s cafeteria by a “real live artist.” The only male and the only officer in this program, he continued these studies until he had enough confidence to enroll in night courses at the Art Students’ League located nearby in midtown Manhattan. Five years there at night were followed by time across the street in the Carnegie Hall Studios. He studied under Daniel Greene, John Howard Sanden, the late Robert Beverly Hale and the late Robert Brackman, among others. Eventually, after nearly twenty years in corporate finance and painting religiously at five every morning before going to work, he resigned from the bank to spend more time painting. Charles Raskob Robinson has exhibited in one-man shows and national and international contemporary marine art exhibitions. His works are in a number of institutional, private and museum collections, including the renowned Malcolm B. Forbes, Sr. Collection and that of the late Thomas Watson, Chairman of IBM. 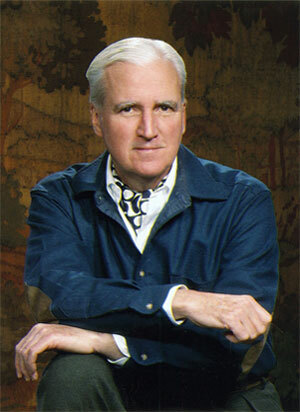 Robinson’s work appears in several books, including: Yacht Portraits: The Best of Contemporary Marine Art; A Gallery of Marine Art; Bound for Blue Water: Contemporary American Marine Art; and Painting the Shore, Ships and the Sea in which he wrote and illustrated a chapter. Over the years, his art has appeared in many magazines – from Architectural Digest to the cover of Yankee Magazine and he has written for others, and is a regular contributor to Fine Art Connoisseur Magazine. He has released about two dozen Limited Edition Lithograph and Gicleẻ Prints including Morning Star depicting the water gardens in Hangzhou, the ancient capitol of China that received USArt Magazine’s “Best Prints Issued” Award. Over two-dozen museums across the country have exhibited his work – from Maine to California and from Florida to Washington State. Robinson is one of two dozen Fellows in the American Society of Marine Artists, a national, not-for-profit, educational organization in which he has been a Charter Member since its founding in 1978. For eighteen years he has written about artists in the Society in his column, “Notes from Brush Hill,” that appears in the Society’s quarterly, the ASMA News & Journal. Because these document the lives of contemporary American marine artists, the Smithsonian American Art/National Portrait Museum Library in Washington, D.C., the Library of Congress and the Thomas J. Watson Research Library at the Metropolitan Museum of Art in New York City archive these articles and make them available internationally. “Brush Hill” is the name of his 1752 studio in Washington, CT, formerly owned by the late New England and New Mexico artist and writer Eric Sloane, where he lives with his wife, Barbara, a horticulturalist, author and attorney. Their two sons are grown and married, each with two children. In 1997 the artist sailed a yawl across the Atlantic in order to do studies at sea. These have resulted in a number of works in a series entitled “The Crossing,” including several groupings of studies under the name Ensemble d’Etudes. In 2010 he completed a series of thirty-five paintings for a successful exhibition. Each of these plein air works, identical size and format, depict the same scene of Lake Waramaug in Connecticut but at different times of the day and year. In 2011 he drew again on his experience crossing the Atlantic and painted Sunrise at Sea: A Symphony in Four Movements. This “en plein ear” quad-tych was inspired by the four movements of Dvorak’s Symphony Number Nine “From the New World.” It is sort of Modest Mussorgsky’s Pictures in an Exhibition in reverse. The work, with headphones and sound track, is currently touring eight museums across the United States. In 2013 he directed the Naval War of 1812 Illustrated, a video documentary by the American Society of Marine Artists in conjunction with the U.S. Navy and dozens of museums. Click here to see it: http://naval-war-of-1812-illustrated.org. 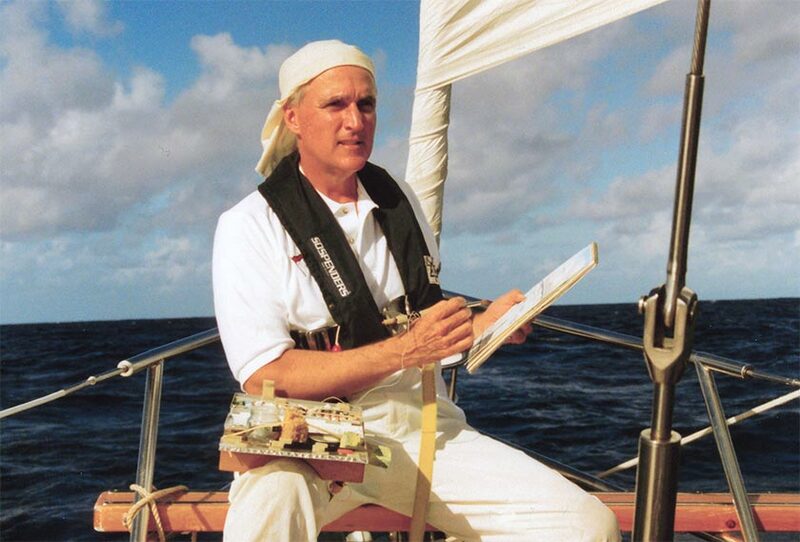 Charles Raskob Robinson with his specially designed “thigh-easel” sketching aboard the 57-foot yawl Bandera as he sailed across the Atlantic. Copyright © 2019 Charles Raskob Robinson. All Rights Reserved. Website by KatArt Graphics.